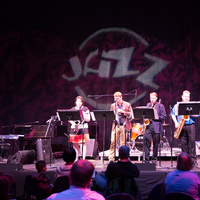 The Cabaret weekend offers great jazz played by Michigan Tech's small jazz combos, Jaztec, Momentum, and guest artists. The "backstage" jazz club atmosphere creates the perfect setting for jazz both hot and cool! Patrick Booth presents the young jazz musicians to our storied Copper Country jazz audience.